Wind, brass and percussion students at the University of Evansville benefit from a nurturing environment which promotes close mentoring by faculty and the expectation of high levels of achievement regardless of their area of study. In addition to studio classes, weekly performance hours, and degree recitals, there is opportunity to participate in a comprehensive array of ensembles. The Wind Ensemble, Orchestra and University Band offer wide ranging large-ensemble repertoire, while chamber music experience can be gained in any number of small ensembles, including quintets (brass or woodwind), like-instrument ensembles (flute, clarinet, trumpet, low-brass, and percussion ensembles), and collaborations with string or vocal students. 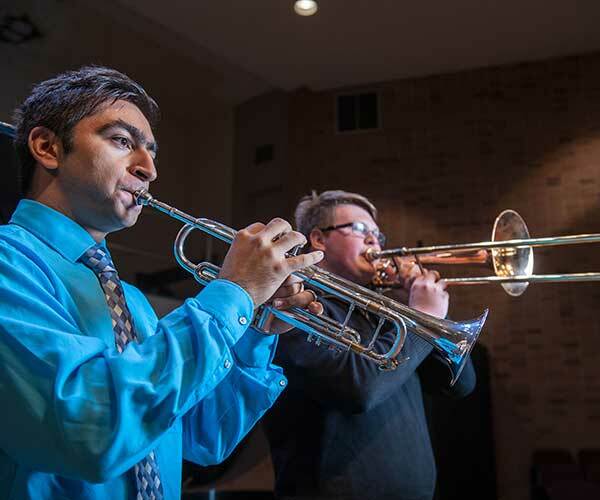 For students interested in Jazz, performing opportunities include two full sized bands. A professionally active faculty includes two distinguished resident performing ensembles in the wind area: the Shepard Brass Quintet and Harlaxton Woodwind Quintet. Students also have the opportunity to meet, hear and interact with world-class guest artists and teachers in master classes and concerts. Recent appearances include composer Michael Daugherty, pianist Abbey Simon, saxophonist jazz pedagog Jamie Aebersol, and Grammy winners Doc Severinsen, and The New York Voices. Advanced instrumental students may be invited to substitute in the Evansville Philharmonic Orchestra, the regional professional symphony. Undergraduates may gain invaluable experience as they perform with musicians of this caliber and study with UE faculty, many of whom hold positions and appear as soloists with the Philharmonic. UE's facilities and equipment range from designated practice rooms with instruments for percussionists to a reed-making room for oboists and bassoonists. In addition to the usual complement of brass, woodwind and percussion instruments, students can also study and perform on varied unique instruments that include, among others, English horns, piccolo and C trumpets, and harmony clarinets.